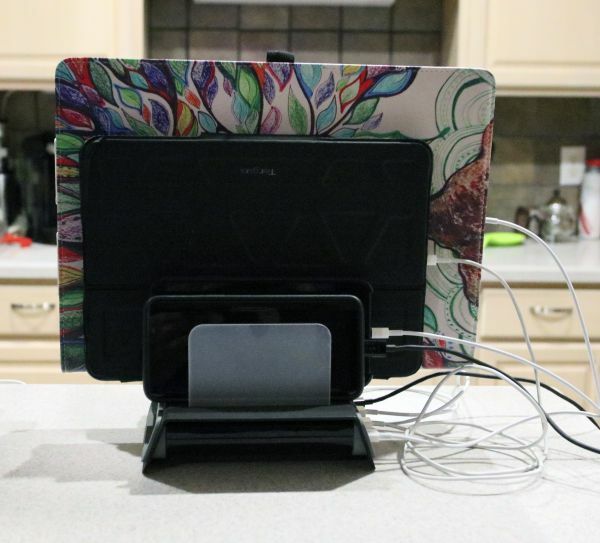 REVIEW – Even though our household only consists of my husband and myself, I always seem to have issues finding an available outlet on our kitchen bar to charge up a piece of tech. We both own tablets and we both own phones. 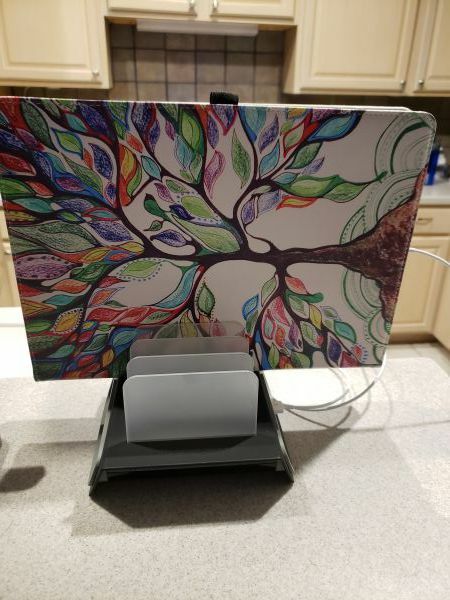 Then there are the plethora of other gadgets like watches, bicycle computers, and other tech devices that need charging. 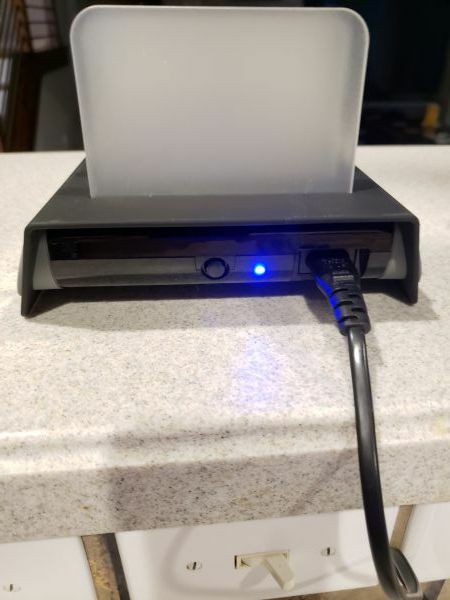 When the Naztech Power Hub4 came up for review I jumped on it to see if it could meet my family’s charging needs. Let’s see how it worked out for us. 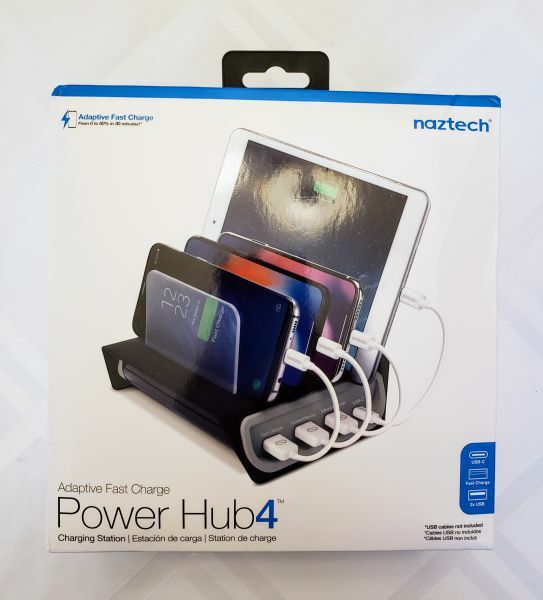 The Naztech Power Hub4 is an adaptive fast charging power station that has slots and ports to charge up to four different devices all at the same time. 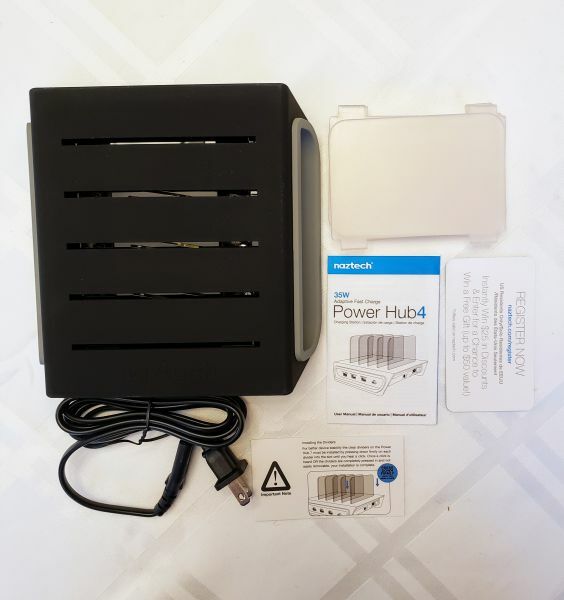 The Power Hub4 can supply up to a full 35 watts of power. 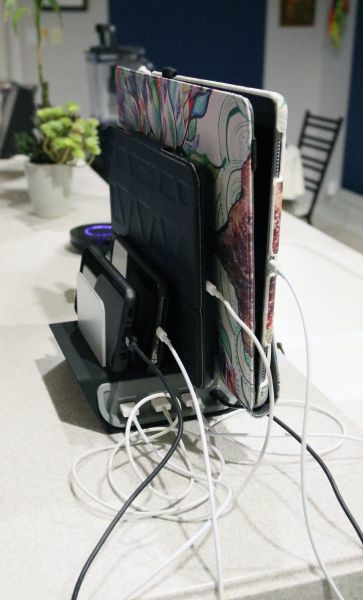 All four ports can charge at the same time. There is one USB-C slot that can rapid charge devices like the Galaxy S9. The USB-C port is rated at 5 volts. There is also an adaptive rapid charge USB port that will charge at 5 volts/3 amps, 9 volts/2 amps, or 12 volts/1.5 amps. The two remaining USB ports share 5 volts/ 2.5 amps. The first picture above shows the back side of the device. On the far right is where the power cord would plugin. To the left of that is the on/off power button. I like that you can actually turn this off when not in use. A blue LED to the right of the power button will shine when it is turned on. It is very bright and I would not recommend placing it in any room where you want complete darkness. 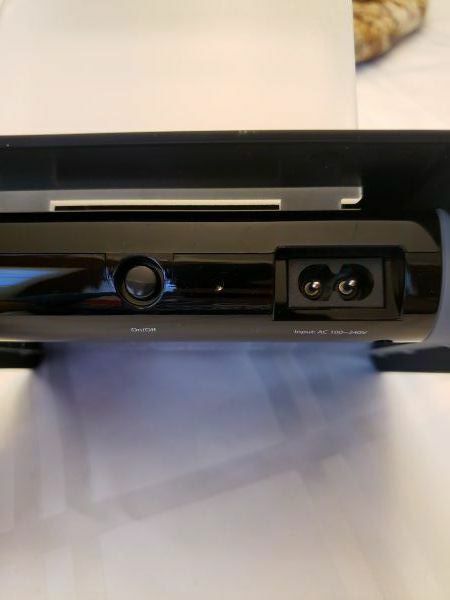 The next two pictures show the front and the side of the device opposite the ports. 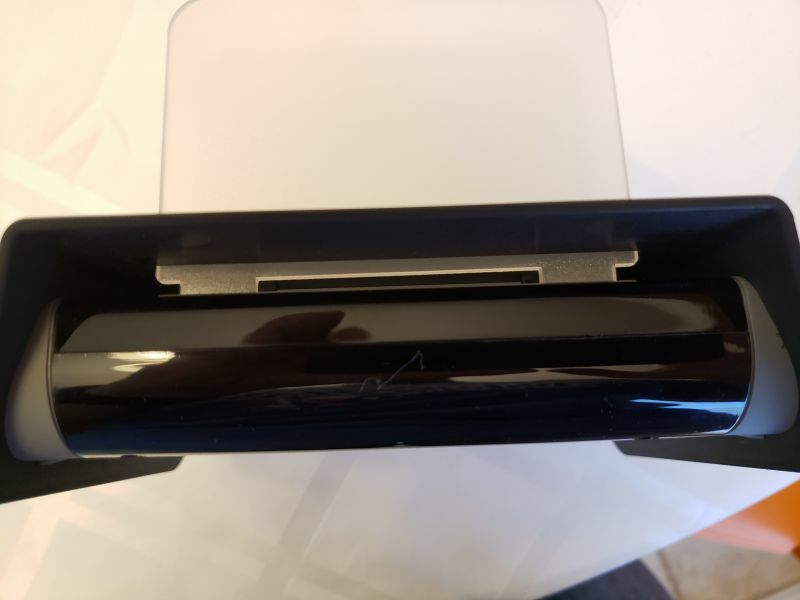 You can see on the front picture how the plastic divider inserts into the device. When this picture was taken, the divider was not pushed all the way down. The small card that came in the box, said to specifically push down very hard until you hear a click. I had to push pretty hard, but I did hear a click for each one. The second picture shows the dividers fully inserted. 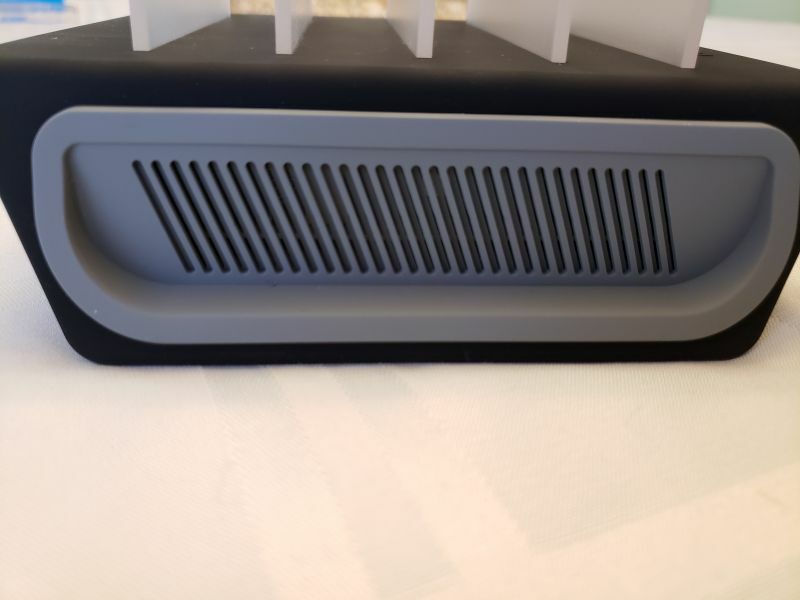 You can also see there are venting slots on that side of the device. This last picture shows the device plugged in and the LED turned on. The Power Hub4 is very sturdy. I have a full-size IPad Pro with a pretty substantial cover on it. 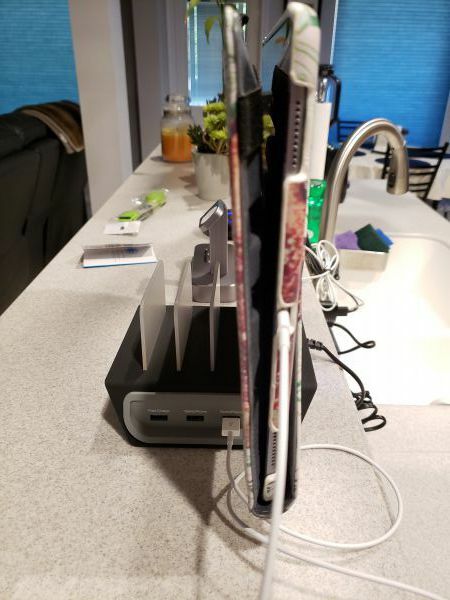 As you can see from the pictures above it held the IPad just fine. The dividers did not bend or show any kind of difficulty holding it in place. The hub itself did not feel tippy and felt solid. The next two pictures show the hub fully loaded. I have my IPad Pro and my husband’s newest model IPad. I also have his IPhone X and my Samsung S9. They were all charging just fine. The Samsung would rapid charge on either the USB-C or the rapid charge USB port. My only real complaint was the wad of cables on the right side of the device. It can charge up to 4 devices at the same time. It has a rapid charge USB and rapid charge USB-C ports. The rapid charge USB port is adaptive. No cables come with the device. I broke down and ordered some short versions of the cables we need. My OCD just could not stand that tangled looking mess of cables on the side of the hub. 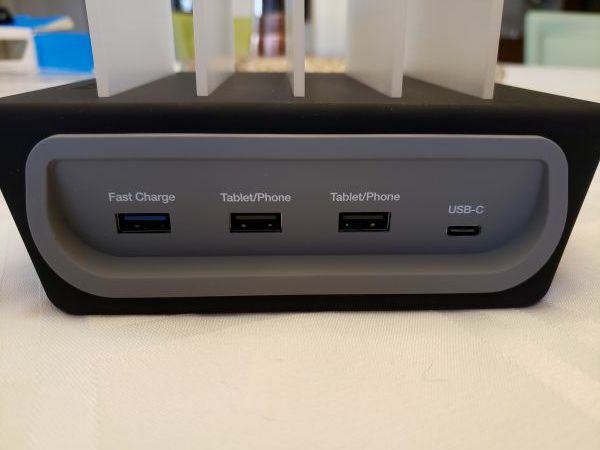 All in all, I would recommend this hub to anyone looking for a way to charge multiple devices at the same time. The fact that it can rapidly charge and be adaptive is a big plus.